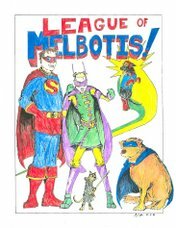 League of Melbotis: V - Episode 4. We watched. I have not watched the show. I don't even read your reviews of each episode but I do page down until I see the obligatory Elizabeth Mitchell pic. Thanks! "I don't want to be rude, but this is a show that counts on its audience to have formed a concept of how government, the FDA, the military, police, religion, etc... function entirely by watching other TV shows." This is my biggest critique of so many shows these days. We have a generation of TV writers who grew up watching mediocre TV shows about doctors, lawyers, and cops, and they write as if watching those shows constituted significant research into the field. This is why lawyers on TV make frivolous and ridiculous objections (but do so with earnest indignation), this is why police officers and FBI agents routinely violate long recognized constitutional protections without apparently realizing (thereby threatening the conviction they so sincerely pursue), and why doctors so often commit malpractice or violate ethical cannons without consequence. In V, just as in FlashForward, some low level FBI agent is the protagonist, when there are so many other angles to explore, but the TV writers think the federal agent is the only way to do this and that and the other. I think you made comment of this to me in one context or another a while back, and when watching this show, it really bugs me in particular. I think because its so half-baked and so directly affects the story. And, Simon, I don't want to get 100% negative. We have to find something we can all appreciate in the show. @JMD I have to agree with you as this is a malaise that affects popular media in general. I'm glad that I'm not in charge of some of these shows as the villains would be absolutely ruthless. The hero wouldn't make it to the third episode. @Ryan No worries, I wasn't really interested in it to begin with and I have other better TV to watch. Well, were the blog to continue, I am sure I would have continued to find reasons to post pictures of Ms. Mitchell. Lost is coming back, right? I would like to find out at least a few hill billys raped some aliens. Thank you for watching this and letting me know not to waste my time. You're the go to guy for maximum TV efficiency consumption. As for you now soon to be empty hour of television when V is over, may I suggest Chuck? Sorry, I was thinking of the Robot Chicken when the rednecks caught an aliens and "probed" him. WTF meaning "Why the Face? ", right?